~STORY COMPLETED! 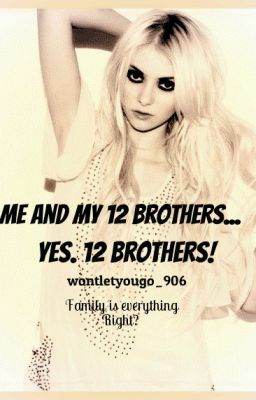 just in process of editing~ Lexi Walker has 12 brothers. Twelve irritating, annoying, bossy and protective brothers. The only female contact she has in her life is her mom and has to cope with all the pranks, arguments and play fighting between the two of them. Having to move suddenly to another state for her mother's new job, Lexi's life isn't all just about her brothers' anymore, especially when she meets her new neighbours. More specifically, Noah Dean, the boy that storms into her life and creates havoc. New people, new feelings and a new place. Will it all be the same? Or will Lexi finally grow up and learn to protect herself instead of her brother's doing that for her? Romance. Friendships. Enemies. Family. Love. Everything that's needed to create a roller coaster of feelings for this girl. Family means everything. Let's just hope it stays that way.